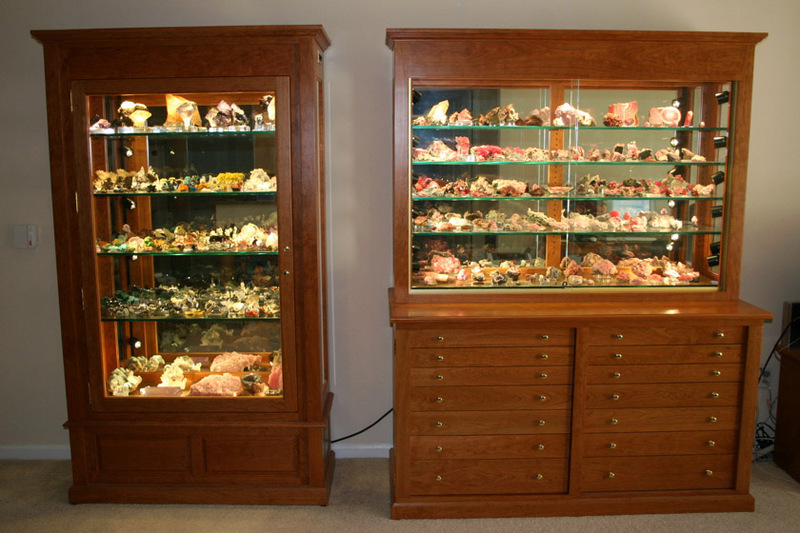 My grandparents, Nettie and Marty Dopler (my mother's father's parents) were both mineral collectors. Marty was also a lapidary. My memories of them are very much entwined with rocks. Heaven was a trip to a rock shop with Nettie and Marty; they encouraged me and my brother Mark to have collections, and sent us wonderful shipments of specimens from their collection for ours. Vacationing in Florida where they lived, I can't think of their home without thinking of their collection. 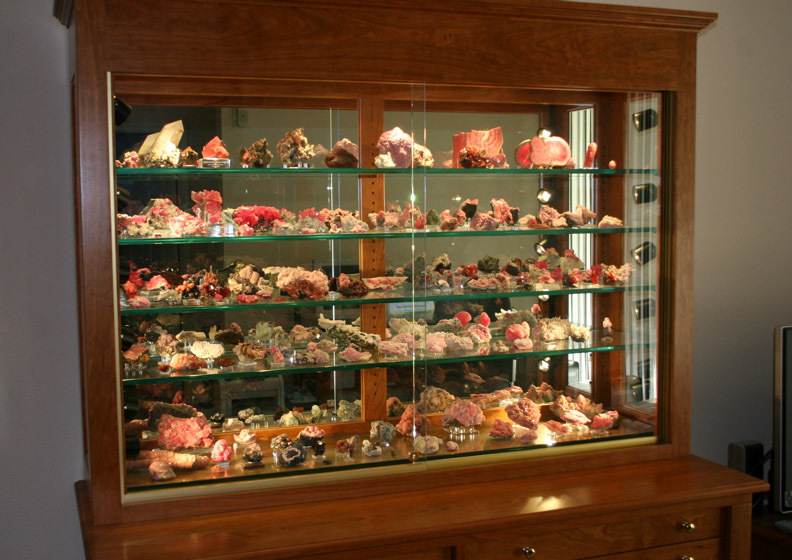 Over time, other interests and pastimes took over, and my interest in mineral specimens went to into hibernation. 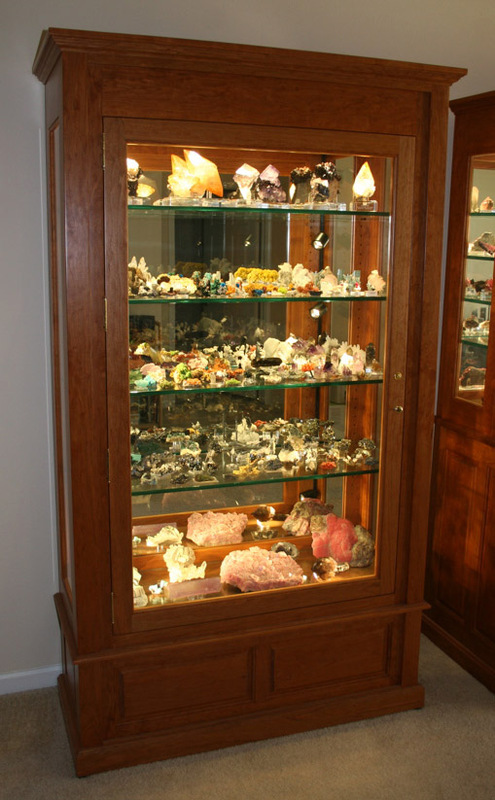 Then, in the summer of 2004, for reasons I am still trying to fathom, I was sorely reinfected with the fascination for minerals. It seems to have had something to do with a trip to Colorado; at least, thats where the earliest onset of symptoms can be traced - seemingly innocent purchases of a sample of Silverton gold ore, and, a couple of days later, a meteorite specimen from a fall in Odessa, Texas in 1922. Not long after returning home from that trip, I discovered that the web now boasts several venues which make it much much too easy to buy incredibly rare and beautiful and rocks on the merest whim - well, at the slightest click of the mouse, at any rate. Having only been reawakened to mineral collecting for some half year now (as I write this), it would be presumptuous to consider myself anything more than a well-funded beginner. I am guessing that this in all likelyhood comes through in the collection: it's broad, unsystematic, and rich in the things I happen to find beautiful or interesting. From the start, however, I have had a special interest in Rhodochrosite. This goes back several years before my reactivated collecting; I can't really remember how it started. It was reenforced by the discovery early-on of treasures of the Sweet Home Mine mine. Ironically, just as my interest in things Manganese Carbonate was being piqued, the Sweet Home was in its final summer of operation, ending a run of almost 15 years of producing some of the most delectable specimens ever collected. The result is that Rhodochrosite is represented in the collection at a level that far outpaces any other single species, in terms both of quality and quantity. But right now, I'm going to go look at some rocks. It's now a couple of years since I penned the above. The size of the collection, (and the depths of my infection!) have increased. There is no end to this, I know now, so tread carefully and beware! Physically, the collection is now housed in two wonderful custom-built cabinets from Keith Williams, who seems to be The Man of the moment for building such. As you can see, one is dedicated to Manganese Carbonate; the tall one is for all of the non-rhodochrosite worldwide specimens I just could not resist. If you are thinking about cabinets, I cannot recommend Keith's cabinets enough. The most wonderful surprise through all of this is that this is where all of the really cool people in the world are, it turns out - in this world of minerals! Note: my apologies to all you really cool people who are not mineral fanatics! ; have you ever spent time with a really nice Bournonite? :-). While fully aware that our mutual quirk of being awestruck by the beauty of natural mineral crystals may be a factor :-), I am still left with this odd feeling that there is something more that draws us together. This - the wonderful people in the mineral collecting world - is the biggest revelation to me. Of course, as in any subculture, we have scroundrels and cynics, but even these, in the end, seem somehow better for being part of this world. Time continues to pass, and the attraction of fine minerals continues to work on me. As of this writing, I am once again self-employed, and hoping to apply my computer skills in pursuit of a livlihood involving minerals. The software implementing this mineral catalog has morphed into a back-end for database-driven mineral dealer websites, and I am providing hosting services. I am also delighted to report that I am, in my humble opion, working with the best web-based mineral dealers. Whether or not I can make it pay the bills consistently is yet to be seen, but I am having a blast! I have just completed an update to this, my own collection catalog, with the goal of moving all of the sites I maintain onto a "common code base". This will allow me to better manage the daunting task up making sure that all of my clients' web sites get the benefit of bug fixes and feature improvements that are made to any of the sites. Don't worry if this means nothing to you, but trust that to a guy who made a carreer in Release Engineering, it's a wonderful thing. How can I not pay homage to the experience of Tucson 2008 and the American Mineral Treasures extravaganza? Words fail me; (See the introduction to Wendell Wilson's article in Volume 39 Number 3, May-June 2008, of the Mineralogical Record. And now, another Tucson come and gone - with great memories of mineral oddities, precious time with my parents, and sharing a place to stay with the likes of Jack Halpern and Carolyn Manchester... a trip to San Manuel to meet Cisco Valenzuela, see his wonderful collection, and come home with a rhodo specimen form a locality new to me. Over the past couple of years I have had some great field collecting opportunities and experiences, at five different localities in four states. Recenty I was very happy to be able to invite my cousin's 14-year old son on his first collecting experience, at Peterson Mountain, NV (Hallelujah Junction), and we had a great time. I have taken the liberty of copying many photographs from the eBay auctions and web galleries where the specimens were purchased. It is with gratitude that I reproduce these here. I will happily remove any upon the request of the copyright holder. If you notice a picture of yours that is not attributed, and you would like it to be, please let me know! Likewise, if you see I have used an image of yours, and you'd rather I didn't, let me know and I'll be happy to remove the picture(s). I'll also be happy to adjust the text used in the credit for "your" specimen(s), at your request. The database implementation and this interface were written by and are Copyright ©2006-2010 by Richard Geiger. The database is implemented in PHP and MySQL, with deployment and revision control via Perforce.